London, UK – March 6, 2019 – The Amplified Group, a European consultancy focused on team and leadership development, today announced the publication of their findings from a recent survey of over 200 IT leaders within the high tech industry. With only 2% of all leaders surveyed experiencing a high score across all five elements, the survey delved deeper into the responses and it emerged that where a company was positioned in its own lifecycle, not how old it is, had a bearing on whether it was able to deliver a high trust culture or not. 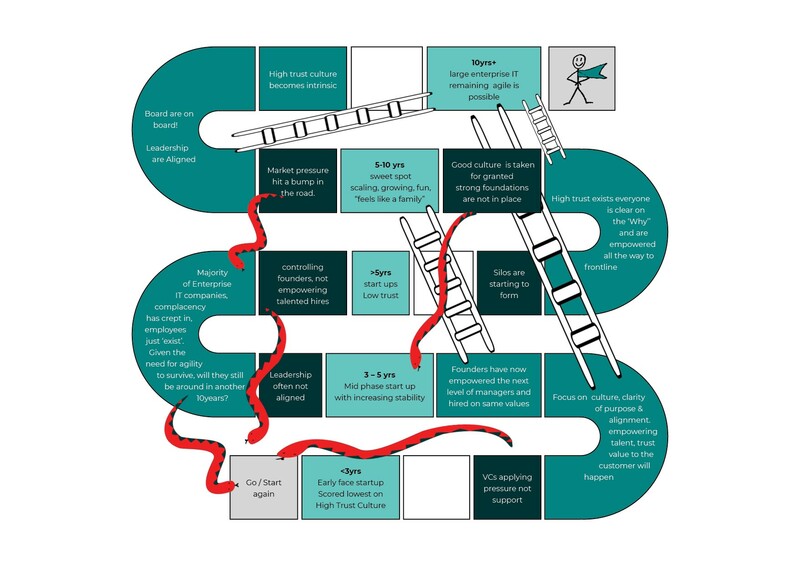 The traditional game of Snakes and Ladders provides a useful illustration of how easy it is to ascend to the next stage or slide to failure as the infographic above depicts. “Having worked in many organisations at different levels of evolution, high tech organisations must act on the findings of this report or face lower levels of success, regardless of whether they are a start up, a unicorn or a dinosaur,” commented Paul Burke, SVP, Glasswall. Founded by two high tech business veterans, Amplified Group was created to transform talented individuals into extraordinary teams by means of the Patrick Lencioni’s Five Behaviors of a team model. Working across industry sectors, Amplified Group has successfully demonstrated productivity increases by focusing organisations on the value of their employees working as a team.